Turns out, all you need is your own two feet to get around to a bunch of unique breweries in downtown San Luis Obispo. These one-of-a-kind SLO CAL craft beer spots are as diverse as they are daring: distinctive sour beers, hoppy IPAS, bold grub and fun times all await. This goes without saying—when you&apos;re pacing all over town looking for the next sip, it&apos;s a good idea to pace yourself. That&apos;s why we&apos;ve created this well-balanced itinerary. Eat, drink, and wear comfy shoes. Start at Libertine Brewing Company, where more than 40 taps line the walls and vinyl spins on the record player. Here, you can try the brew house&apos;s famously sour wild ales or go for a range of beers from SLO CAL, the state and the world. Order up the “Mac and Beer Cheese” or a mess of tots for lunch (there are healthier options if you must) or stop in for Sunday Brunch, where the eggs are always farm fresh and the sausage is marinated overnight in Libertine&apos;s popular Wild IPA. You know, just to intensify the flavor. Now that you&apos;ve filled up on food, it&apos;s time for a bit of adventure. Strut yourself over to Barrelhouse Brewing Co, but keep your eyes peeled. While the brewery appears—at least from the outside—to be your average old-timey barbershop, this is just a clever trick. Downstairs, you&apos;ll find the speakeasy-style tap room, where light and frothy to dark and rich BarrelHouse Brews are poured (even if you don&apos;t have the password). It&apos;s time for another nosh! Stop over at SLO Brew, where happy hour runs from 3 to 6 p.m. Deviled eggs, bacon on a stick, chips and salsa, street tacos, wings and more are all served at a reduced price—but you can still order up a killer entree or pizza alongside a pitcher of classic SLO Brew Reggae Red or Cali-Squeeze. These beers are totally SLO CAL (don&apos;t forget to try the new Bubblegum Alley brew, an American Pale Ale and homage to the famously sticky monument located just across the street). You should have been drinking water all day, but now is your time to chug that water as you stroll downtown and check out the sights. Yes, you&apos;ll thank us tomorrow! Catch a flick at the Palm Theater or the historic Fremont, meander around the creek, or do a little shopping. You&apos;ll find plenty of mom and pop shops, ice cream joints, and fun coffee houses along your journey. We won&apos;t blame you if you go for a cat nap right about now, either. Ready to venture out again? 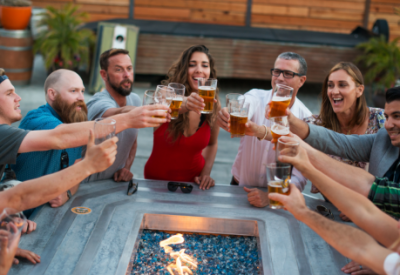 The original Central Coast Brewing location is located just a few blocks north of downtown on Monterey Street, and you&apos;ll want to stop by 5:30-8:30 p.m. every Tuesday for tacos and lively conversation. Try their gold-medal winning Monterey Street IPA, among other classic, well-balanced brews. Looking for a more substantial dinner? Hit up your fave ride-sharing service and hitch a ride to Central Coast Brewing Company&apos;s second locale, just a few blocks south of downtown. Sure, you could walk it, but we won&apos;t tell anyone you cheated. This new 10,000 square foot brewhouse features a crackling fire pit out front and a range of dinner options (Including salads, pizzas, sandwiches, and more). Kick up those shoes by the fire or play a few classic arcade games. Now you can toast to one truly remarkable day of craft beer exploration. There&apos;s more beer off the beaten path! Well, we don&apos;t recommend you hit every SLO brewery in one day. 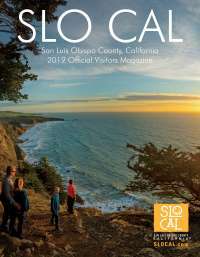 Plan to check out Santa Maria Brewing Co., Seven Sisters Brewing Company and Bang the Drum Brewery on your next outing. Because some of the best beers aren&apos;t located in downtown San Luis Obispo—they are off the beaten path!